Do you believe in C? Do you believe in anything that has to do with me? Most of the iOS API involves the Objective-C language, and most of your iOS programming will be in the Objective-C language; and Objective-C is a superset of C. This means that Objective-C presupposes C; everything that is true of C trickles up to Objective-C. A common mistake is to forget that “Objective-C is C” and to neglect a basic understanding of C.
Some of the iOS API involves C rather than Objective-C. Even in Objective-C code, you often need to use C data structures and C function calls. For example, a rectangle is represented as a CGRect, which is a C struct, and to create a CGRect from four numbers you call CGRectMake, which is a C function. The iOS API documentation will very often show you C expressions and expect you to understand them. The best way to learn C is to read The C Programming Language (PTR Prentice Hall, 1988) by Brian W. Kernighan and Dennis M. Ritchie, commonly called K&R (Ritchie was the creator of C). It is one of the best computer books ever written: brief, dense, and stunningly precise and clear. K&R is so important for effective iOS (and Mac OS X) programming that I keep a physical copy beside me at all times while coding, and I recommend that you do the same. Another useful manual is The C Book, by Mike Banahan, Declan Brady and Mark Doran, available online at http://publications.gbdirect.co.uk/c_book/. It would be impossible, and unnecessary, for me to describe all of C in a single chapter. C is not a large or difficult language, but it has some tricky corners and can be extremely subtle, powerful, and low-level. Moreover, since C is described fully and correctly in the manuals I’ve just mentioned, it would be a mistake for me to repeat what they can tell you better than I. You don’t have to know all about C in order to use Objective-C effectively, though; so my purpose in this chapter is to outline those aspects of C that are important for you to understand at the outset, before you even start using Objective-C for iOS programming. That’s why this chapter is “Just Enough C”: it’s just enough to get you going, comfortably and safely. Just keep in mind that this chapter is not a technical manual of C.
Quickly skim K&R Chapter 1, the tutorial. Carefully read K&R Chapters 2 through 4. Read the first three sections of K&R Chapter 5 on pointers and arrays. You don’t need to read the rest of Chapter 5 because you won’t typically be doing any pointer arithmetic, but you do need to understand clearly what a pointer is, as Objective-C is all about objects, and every reference to an object is a pointer; you’ll be seeing and using that * character constantly. Read also the first section of K&R Chapter 6, on structures (structs); as a beginner, you probably won’t define any structs, but you will use them quite a lot, so you’ll need to know the notation (for example, as I’ve already said, a CGRect is a struct). Glance over K&R Appendix B, which covers the standard library, because you may find yourself making certain standard library calls, such as the mathematical functions; forgetting that the library exists is a typical beginner mistake. Just to make things a little more confusing, the C defined in K&R is not precisely the C that forms the basis of Objective-C. Developments subsequent to K&R have resulted in further C standards (ANSI C, C89, C99), and the Xcode compiler extends the C language in its own ways. By default, Xcode projects are treated as GNU99, which is itself an extension of C99 (though you could specify another C standard if you really wanted to). Fortunately, the most important differences between K&R’s C and Xcode’s C are small, convenient improvements that are easily remembered, so K&R remains the best and most reliable C reference. Any purely syntactic errors (meaning that you spoke the C language incorrectly) will be caught by the compiler, and the program won’t even begin to run. If your program gets past the compiler, then it will run, but there is no guarantee that you haven’t made some other sort of mistake, which can be detected only by noticing that the program doesn’t behave as intended. The C compiler is fussy, but you should accept its interference with good grace. The compiler is your friend: learn to love it. It may emit what looks like an irrelevant or incomprehensible error message, but when it does, the fact is that you’ve done something wrong and the compiler has helpfully caught it for you. Also, the compiler can warn you if something seems like a possible mistake, even though it isn’t strictly illegal; these warnings, which differ from outright errors, are also helpful and should not be ignored. I have said that running a program requires a preceding stage: compilation. But in fact there is a third stage that precedes compilation: preprocessing. (It doesn’t really matter whether you think of preprocessing as a stage preceding compilation or as the first stage of compilation.) Preprocessing modifies your text, so when your text is handed to the compiler, it is not identical to the text you wrote. Preprocessing might sound tricky and intrusive, but in fact it proceeds only according to your instructions and is helpful for making your code clearer and more compact. Xcode allows you to view the effects of preprocessing on your program text (choose Product → Generate Output → Preprocessed File), so if you think you’ve made a mistake in instructing the preprocessor, you can track it down. I’ll talk more later about some of the things you’re likely to say to the preprocessor. C is a statement-based language; every statement ends in a semicolon. (Forgetting the semicolon is a common beginner’s mistake.) For readability, programs are mostly written with one statement per line, but this is by no means a hard and fast rule: long statements (which, unfortunately, arise very often because of Objective-C’s verbosity) are commonly split over multiple lines, and extremely short statements are sometimes written two or three to a line. You cannot split a line just anywhere, however; for example, a literal string can’t contain a return character. Indentation is linguistically meaningless and is purely a matter of convention (and C programmers argue over those conventions with near-religious fervor); Xcode helps “intelligently” by indenting automatically, and you can use its automatic indentation both to keep your code readable and to confirm that you’re not making any basic syntactic mistakes. These are sometimes called C++-style comments and are much more convenient for brief comments than the K&R comment syntax. Throughout the C language (and therefore, throughout Objective-C as well), capitalization matters. All names are case-sensitive. There is no such data type as Int; it’s lowercase “int.” If you declare an int called lower and then try to speak of the same variable as Lower, the compiler will complain. By convention, variable names tend to start with a lowercase letter. A hybrid compiler, LLVM-GCC, provides the advantages of LLVM compilation, but the code is parsed with GCC for maximum backward compatibility. A pure LLVM compiler (also referred to as Clang) does its own parsing and provides more intelligent and helpful error messages and warnings. The basic built-in C data types are all numeric: char (one byte), int (four bytes), float and double (floating-point numbers), and varieties such as short (short integer), long (long integer), unsigned short, and so on. A numeric literal may optionally express its type through a suffixed letter or letters: for example, 4 is an int, but 4UL is an unsigned long; 4.0 is a double, but 4.0f is a float. Objective-C makes use of some further numeric types derived from the C numeric types (by way of the typedef statement, K&R 6.7) designed to respond to the question of whether the processor is 64-bit; the most important of these are NSInteger (along with NSUInteger) and CGFloat. You don’t need to use them explicitly unless an API tells you to, and even when you do, just think of NSInteger as int and CGFloat as float, and you’ll be fine. In that particular example, the explicit cast is unnecessary because the integer value will be cast to a float implicitly as it is assigned to a float variable, but it illustrates the notation. You’ll find yourself typecasting quite a bit in Objective-C, mostly to subdue the worries of the compiler (examples appear in Chapter 3). That definition assigns the value 0 to the name UIStatusBarAnimationNone, the value 1 to the name UIStatusBarAnimationFade, and the value 2 to the name UIStatusBarAnimationSlide. The upshot is that you can use the suggestively meaningful names without caring about, or even knowing, the arbitrary numeric values they represent. It’s a useful idiom, and you may well have reason to define enums in your own code. That looks almost exactly like the old way of expressing the same enum, but the new way involves some notation that isn’t part of standard C, telling the compiler what variety of integer value is being used here (it’s an NSInteger). This makes UIStatusBarAnimation a little more like a genuine data type. It also lets Xcode help you more intelligently — for example, when performing code completion, as discussed in Chapter 9. Another macro, NS_OPTIONS, evaluates in Objective-C as a synonym of NS_ENUM (they are distinct only in C++ code, which is not discussed in this book). Notice the at-sign! This expression is actually a directive to the Objective-C compiler to form an NSString object. A common mistake is forgetting the at-sign, thus causing your expression to be interpreted as a C string, which is a completely different animal. NSStrings are natively Unicode-based, but because Objective-C is C, including non-ASCII characters in a literal NSString was, until quite recently, remarkably tricky, and you needed to know about such things as the \x and \u escape sequences. Now, however, it is perfectly legal to type a non-ASCII character directly into an NSString literal, and you should ignore old Internet postings (and even an occasional sentence in Apple’s own documentation) warning that it is not. @"This is a big long literal string "
C offers few simple native data types, so how are more complex data types made? There are three ways: structures, pointers, and arrays. Both structures and pointers are going to be crucial when you’re programming iOS. You’re less likely to need a C array, because Objective-C has its own NSArray object type, but it will arise in a couple of examples later in this book. A C structure, usually called a struct (K&R 6.1), is a compound data type: it combines multiple data types into a single type, which can be passed around as a single entity. Moreover, the elements constituting the compound entity have names and can be accessed by those names through the compound entity, using dot-notation. The iOS API has many commonly used structs, typically accompanied by convenience functions for working with them. In that example, CGContextFillRect is a function. I’ll talk about functions later in this chapter, but the upshot of the example is that what comes after the first comma has to be a CGRect, and can therefore be a CGRect initializer provided this is accompanied by a CGRect cast. The other big way that C extends its range of data types is by means of pointers (K&R 5.1). A pointer is an integer (of some size or other) with a meaning: it designates the location in memory where the real data is to be found. Knowing the structure of that data and how to work with it, as well as allocating a block of memory of the required size beforehand and disposing of that block of memory when it’s no longer needed, is a very complicated business. Luckily, this is exactly the sort of complicated business that Objective-C is going to take care of for us. So all you really have to know to use pointers is what they are and what notation is used to refer to them. I prefer the first form, but I do occasionally use the second form, and Apple quite often uses it, so be sure you understand that these are all ways of saying the same thing. No matter how the spaces are inserted, the name of the type is still int*. If you are asked what type intPtr is, the answer is int* (a pointer to an int); the asterisk is part of the name of the type of this variable. If you needed to cast a variable p to this type, you’d cast like this: (int*)p. Once again, it is possible that you’ll see code where there’s a space before the asterisk, like this: (int *)p.
In pure C, having declared a pointer-to-integer called intPtr, you are liable to speak later in your code of *intPtr. This notation, outside of a declaration, means “the thing pointed to by the pointer intPtr.” You speak of *intPtr because you wish to access the integer at the far end of the pointer; this is called dereferencing the pointer. But in Objective-C, this is generally not the case. In your code, you’ll be treating the pointer to an object as the object; you’ll never dereference it. So, for example, having declared s as a pointer to an NSString, you will not then proceed to speak of *s; rather, you will speak simply of s, as if it were the string. All the Objective-C stuff you’ll want to do with an object will expect the pointer, not the object at the far end of the pointer; behind the scenes, Objective-C itself will take care of the messy business of following the pointer to its block of memory and doing whatever needs to be done in that block of memory. This fact is extremely convenient for you as a programmer, but it does cause Objective-C users to speak a little loosely; we tend to say that “s is an NSString,” when of course it is actually a pointer to an NSString. Now ptr1 and ptr2 are pointing at the same thing. Any change to the thing pointed to by ptr1 will also change the thing pointed to by ptr2, because they are the same thing (Figure 1.1). Meanwhile, whatever ptr1 was pointing to before the assignment is now not being pointed to by ptr1; it might, indeed, be pointed to by nothing (which could be bad). A firm understanding of these facts is crucial when working in Objective-C, and I’ll return to this topic in Chapter 3. Curiously, the name of an array is the name of a pointer (to the first element of the array). Thus, for example, having declared arr as in the preceding examples, you can use arr wherever a value of type int* (a pointer to an int) is expected. This fact is the basis of some highly sophisticated C idioms that you almost certainly won’t need to know about (which is why I don’t recommend that you read any of K&R Chapter 5 beyond section 3). Having done that, you can pass arr as the second argument in a call to CGContextStrokeLineSegments. Also, a C string, as I’ve already mentioned, is actually an array. For example, the NSString method stringWithUTF8String: takes (according to the documentation) “a NULL-terminated C array of bytes in UTF8 encoding;” but the parameter is declared not as an array, but as a char*. Those are the same thing, and are both ways of saying that this method takes a C string. To get 1.5, you should have written i/2.0 or (float)i/2. The integer increment and decrement operators (K&R 2.8), ++ and --, work differently depending on whether they precede or follow their variable. The expression ++i replaces the value of i by 1 more than its current value and then uses the resulting value; the expression i++ uses the current value of i and then replaces it with 1 more than its current value. This is one of C’s coolest features. and so on. The reason for this bit-based representation is that these values can be combined into a single value (a bitmask) that you pass to set the autoresizingMask. All Cocoa has to do to understand your intentions is to look to see which bits in the value that you pass are set to 1. So, for example, 00001010 would mean that UIViewAutoresizingFlexibleTopMargin and UIViewAutoresizingFlexibleWidth are true (and that the others, by implication, are all false). What gets assigned to myVariable depends on the truth value of the condition. There’s nothing happening here that couldn’t be accomplished more verbosely with flow control (see the next section), but the ternary operator can greatly improve clarity, and I use it a lot. After the closing curly brace in the fourth line, the i introduced in the second line has ceased to exist, because its scope is the inside of the curly braces. If the contents of the curly braces consist of a single statement, the curly braces can be omitted, but I would advise beginners against this shorthand, as you can confuse yourself. A common beginner mistake (which will be caught by the compiler) is forgetting the parentheses around the condition. The full set of flow control statements is given in K&R Chapter 3, and I’ll just summarize them schematically here (Example 1.1). The if...else if...else structure can have as many else if blocks as needed, and the else block is optional. Instead of an extended if...else if...else if...else structure, when the conditions would consist of comparing various values against a single value, you can use the switch statement; be careful, though, as it is rather confusing and can easily go wrong (see K&R 3.4 for full details). The main trick is to remember to end every case with a break statement, unless you want it to “fall through” to the next case (Example 1.2). To abort a loop from inside the curly braces, use the break statement. To abort the current iteration from within the curly braces and proceed to the next iteration, use the continue statement. In the case of while and do, continue means to perform immediately the conditional test; in the case of a for loop, continue means to perform immediately the after-each statement and then the conditional test. C also has a goto statement that allows you to jump to a named (labeled) line in your code (K&R 3.8); even though goto is notoriously “considered harmful,” there are situations in which it is pretty much necessary, especially because C’s flow control is otherwise so primitive. It is permissible for a C statement to be compounded of multiple statements, separated by commas, to be executed sequentially. The last of the multiple statements is the value of the compound statement as a whole. This construct, for instance, lets you perform some secondary action before each test of a condition or perform more than one after-each action (an example appears in Chapter 17). We can now turn to the question of what a condition consists of. C has no separate boolean type; a condition either evaluates to 0, in which case it is considered false, or it doesn’t, in which case it is true. Comparisons are performed using the equality and relational operators (K&R 2.6); for example, == compares for equality, and < compares for whether the first operand is less than the second. Logical expressions can be combined using the logical-and operator (&&) and the logical-or operator (||); using these along with parentheses and the not operator (!) you can form complex conditions. Evaluation of logical-and and logical-or expressions is short-circuited, meaning that if the left condition settles the question, the right condition is never even evaluated. Don’t confuse the logical-and operator (&&) and the logical-or operator (||) with the bitwise-and operator (&) and the bitwise-or operator (|) discussed earlier. Writing & when you mean && (or vice versa) can result in surprising behavior. C is a function-based language (K&R 4.1). A function is a block of code defining what should happen; when other code calls (invokes) that function, the function’s code does happen. A function returns a value, which is substituted for the call to that function. That example is extremely simple, but it illustrates many key aspects of functions. We start with the type of value that the function returns; here, it returns an int. Then we have the name of the function, which is square. Then we have parentheses, and here we place the data type and name of any values that this function expects to receive. Here, square expects to receive one value, an int, which we are calling i. The name i (along with its expected data type) is a parameter; when the function is called, its value will be supplied as an argument. If a function expects to receive more than one value, multiple parameters in its definition are separated by a comma (and when the function is called, the arguments supplied are likewise separated by a comma). Finally, we have curly braces containing the statements that are to be executed when the function is called. That function call effectively assigns 3 to the function’s i parameter and 4 to the function’s j parameter. You’re allowed to say that, but it doesn’t seem to serve much purpose. On the other hand, the point of a function might be not so much the value it returns as other things it does as it is executing, so then it might make perfect sense to ignore its result. That is a legal program, but only because the definition of the square function precedes the call to that function. If we wanted to place the definition of the square function elsewhere, such as after the call to it, we would need at least to precede the call with a declaration of the square function (Example 1.3). The declaration looks just like the first line of the definition, but it is a statement, ending with a semicolon, rather than a left curly brace. Objective-C is chock-a-block with pointers (and asterisks). Objective-C methods typically expect pointer parameters and return a pointer value. But this doesn’t make things more complicated, because, as I’ve already mentioned, your variables referring to Objective-C objects are pointers. Pointers are what Objective-C expects, but pointers are also what Objective-C gives you. Pointers are exactly what you’ve got, so there’s no problem. Sometimes, however, a function or method expects as a parameter a pointer to a thing, but what you’ve got is not that pointer but the thing itself. Thus, you need a way to create a pointer to that thing. The solution is the address operator (K&R 5.1), which is an ampersand before the name of the thing. Now, never mind what an id is, and don’t worry about the Objective-C method declaration syntax. Just consider the types of the parameters. The first one is an NSString*; that’s no problem, as every reference to an NSString is actually a pointer to an NSString. An NSStringEncoding turns out to be merely an alias to a primitive data type, an NSUInteger, so that’s no problem either. But what on earth is an NSError**? The important thing to notice is the ampersand. Because myError is a pointer to an NSError, &myError is a pointer to a pointer to an NSError, which is just what we’re expected to provide. Thus, everything goes swimmingly. So the idea is that you first check result to see whether it’s nil. If it isn’t, fine; it’s the string you asked for. If it is, you then study the NSError that myError is now pointing to, to learn what went wrong. This pattern is frequently used in Cocoa. You can use the address operator to create a pointer to any named variable. A C function is technically a kind of named variable, so you can even create a pointer to a function! This is an example of when you’d use the name of the function without the parentheses: you aren’t calling the function, you’re talking about it. For example, &square is a pointer to the square function. Moreover, just as the bare name of an array is implicitly a pointer to its first element, the bare name of a function is implicitly a pointer to the function; the address operator is optional. In Chapter 3, I describe a situation in which specifying a pointer to a function is a useful thing to do. Another operator used in connection with pointers, or when memory must be allocated dynamically, is sizeof. It may be followed by a type name in parentheses or by a variable name; a variable name needn’t be in parentheses, but it can be, so most programmers ignore the distinction and use parentheses routinely, as if sizeof were a function. The little dance of declaring a function before calling it (Example 1.3) may seem rather absurd, but it is of tremendous importance in the C language, because it is what allows a C program to be arbitrarily large and complex. As your program grows, you can divide and organize it into multiple files. This kind of organization can make a large program much more maintainable — easier to read, easier to understand, easier to change without accidentally breaking things. A large C program therefore usually consists of two kinds of file: code files, whose filename extension is .c, and header files, whose filename extension is .h. The build system will automatically “see” all the files and will know that together they constitute a single program, but there is also a rule in C that code inside one file cannot “see” another file unless it is explicitly told to do so. Thus, a file itself constitutes a scope; this is a deliberate and valuable feature of C, because it helps you keep things nicely pigeonholed. The way you tell a C file to “see” another file is with the #include directive. The hash sign in the term #include is a signal that this line is an instruction to the preprocessor. In this case, the word #include is followed by the name of another file, and the directive means that the preprocessor should simply replace the directive by the entire contents of the file that’s named. In each .c file, put the code that only this file needs to know about; typically, each file’s code consists of related functionality. In each .h file, put the function declarations that multiple .c files might need to know about. Have each .c file include those .h files containing the declarations it needs to know about. So, for example, if function1 is defined in file1.c, but file2.c might need to call function1, the declaration for function1 can go in file1.h. 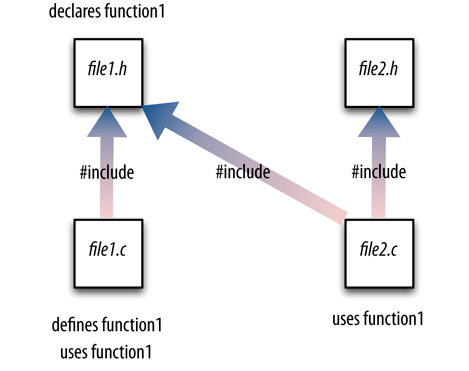 Now file1.c can include file1.h, so all of its functions, regardless of order, can call function1, and file2.c can also include file1.h, so all of its functions can call function1 (Figure 1.2). In short, header files are a way of letting code files share knowledge about one another without actually sharing code (because, if they did share code, that would violate the entire point of keeping the code in separate files). But how does the compiler know where, among all these multiple .c files, to begin execution? Every real C program contains, somewhere, exactly one function called main, and this is always the entry point for the program as a whole: the compiler sets things up so that when the program executes, main is called. The organization for large C programs that I’ve just described will also be, in effect, the organization for your iOS programs. (The chief difference will be that instead of .c files, you’ll use .m files, because .m is the conventional filename extension for telling Xcode that your files are written in Objective-C, not pure C.) Moreover, if you look at any iOS Xcode project, you’ll discover that it contains a file called main.m; and if you look at that file, you’ll find that it contains a function called main. That’s the entry point to your application’s code when it runs. The big difference between your Objective-C code files and the C code files I’ve been discussing is that instead of saying #include, your files will say #import. The #import preprocessor directive is not mentioned in K&R. It’s an Objective-C addition to the language. It’s based on #include, but it is used instead of #include because it (#import) contains some logic for making sure that the same material is not included more than once. Such repeated inclusion is a danger whenever there are many cross-dependent header files; use of #import solves the problem neatly. That line is essentially a single massive #import that copies into your program the declarations for the entire basic iOS API. Moreover, each of your .m files #imports its corresponding .h file, including whatever the .h file #imports. Thus, all your code files include the basic iOS declarations. After the preprocessor operates on all your files, your .m files actually contain that definition of CGPoint. (You can even choose Product → Generate Output → Preprocessed File, as I mentioned earlier, to confirm that this is true.) And that is why your code is able to use a CGPoint! Look for the named file in the same folder as this file (the .m file in which the #import line occurs). In general, you’ll use angle brackets to refer to a header file owned by the Cocoa API and quotation marks to refer to a header file that you wrote. If you’re curious as to what an #import directive imports, select it (in Xcode) and choose File → Open Quickly to display the contents of the designated header file. Starting with LLVM compiler version 3.1, which made its debut in Xcode 4.3, Objective-C no longer requires that a function declaration precede the use of that function, provided that the definition of that function follows in the same file. In other words, code inside an Objective-C class can call a function — or an Objective-C method — even if that call precedes the definition of that function or method, and even if there is no separate declaration of that function or method. Thus, in modern Objective-C, the order of functions and methods within a .m file doesn’t matter, and it is not necessary to declare functions or methods within a .m file at all! The only place you’ll ever need to declare functions or methods will be in a .h file, and only so that some .m file other than the file where they are defined can import that .h file and call the function (or method). Bear in mind that this convenience is a feature of Objective-C, not of C. I’m talking about .m files, not .c files. I’ll describe more precisely in Chapter 4 the region of a .m file in which this convenience applies — namely, a class’s implementation section. You also have at your disposal a large collection of built-in C library files. A library file is a centrally located collection of C functions, along with a .h file that you can include so as to make those functions available to your code. In your iOS programs, math.h is included for you as part of the massive UIKit #import, so there’s no need to include it again. But some library functions might require an explicit #import. The standard library is discussed in K&R Appendix B. But the modern standard library has evolved since K&R; it is a superset of K&R’s library. The ceil function, for example, is listed in K&R appendix B, but the ceilf function is not. Similarly, if you wanted to generate a random number (which is likely if you’re writing a game program that needs to incorporate some unpredictable behavior), you probably wouldn’t use the rand function listed in K&R; you’d use the random function, which supersedes it. Forgetting that Objective-C is C and that the C library functions are available to your code is a common beginner mistake. Of the many other available preprocessor directives, the one you’ll use most often is #define. It is followed by a name and a value; at preprocess time, the value is substituted for the name down through this code file. As K&R very well explain (K&R 1.4), this is a good way to prevent “magic numbers” from being hidden and hard-coded into your program in a way that makes the program difficult to understand and maintain. Now instead of the “magic number” 3.0, my code uses a meaningful name, MIDSPACE; at preprocessor time, the text MIDSPACE is replaced with the text 3.0. So it amounts to the same thing, but if I decide to change this value and try a different one, all I have to change is the #define line, not every occurrence of the number 3.0. Now use MYKEY throughout your code instead of @"mykey", and if you mistype it (as MYKKEY or what have you), the preprocessor won’t perform any substitution and the compiler will complain, catching the mistake for you. The #define directive can also be used to create a macro (K&R 4.11.2), a more elaborate form of text substitution. You’ll encounter a few Cocoa macros in the course of this book, but they will appear indistinguishable from functions; their secret identity as macros won’t concern you. There is also a #pragma mark directive that’s useful with Xcode; I talk about it when discussing the Xcode programming environment (Chapter 9). A variable’s data type can be declared with a qualifier before the name of the type, modifying something about how that variable is to be used. For example, the declaration can be preceded by the term const, which means (K&R 2.4) that it is illegal to change the variable’s value; the variable must be initialized in the same line as the declaration, and that’s the only value it can ever have. (Never mind what UIKIT_EXTERN means.) This declaration tells you that UIApplicationStatusBarOrientationUserInfoKey is the name of an NSString, and you are to trust that its value is set for you. You are to go ahead and use this name whenever you want to speak of this particular key, secure in the knowledge that the actual string value will be substituted. You do not have to know what that actual string value is. In this way, if you make a mistake in typing the variable name, the compiler will catch the mistake because you’ll be using the name of an undefined variable. That code says: If the CardPainter instance sp has never been created, create it, and in any case, now return it. Thus, no matter how many times this method is called, the instance will be created just once and that same instance will be returned every time. Static variables are a C language feature, not an Objective-C language feature. Therefore, a static variable knows nothing of classes and instances; even if it appears inside a function or a method, it is defined at the level of a file, which means, in effect, at the level of your program as a whole. That’s fine when you’re using it in a class factory method, because a class is unique to your program as a whole. But never use a static variable in an Objective-C instance method, because your program can have multiple such instances, and the value of this one static variable will apply across all of them. In other words, don’t use a C static variable as a lazy substitute for an Objective-C instance variable (Chapter 2). I’ve made that mistake, and trust me, the results are not pretty.